In Raleigh, a shotgun went off when the owner was taking it out of its case at a security checkpoint, injuring three people. In Indianapolis, a 54-year-old man appears to have accidentally shot himself in the hand as he was leaving a gun show. And in Ohio, a dealer was checking out a purchase when he pulled the trigger by accident and injured his friend. Although he had removed the magazine from the weapon, a round remained in the chamber. Where else in our civilization do so many strenuously argue that things should be out of control? The problem here lies in an unfortunate and perhaps deliberate confusion that "control" means "confiscation." Yet we control cars and drivers without taking away anyone's vehicle. We control access to narcotics but don't deny them to those with a real need. We limit what can be said in many places, but don't equate that to suppression of free speech. But perhaps the best analogy is air travel, both for the practical mechanics and for the vitriol it provokes in some people. We control who, and what, gets on commercial airplanes, because it is a public safety issue. Not everyone likes the rules, and there is no small amount of security theater, where some rules appear more for show than for practical effect. Still, no one seriously suggests we should let people carry anything they like, no matter how dangerous, into the cabin. Nor is there an adamant insistence that anyone be allowed to board—those individuals dangerous to themselves or others shouldn't co-mingle in such a confined space. We even confiscate guns from anyone trying to bring them on board, unless perhaps they are a US Marshal. The public has no weapons, but our government does! Feel the tyranny! 85% of the American public supports background checks as part of gun shows or private sales. 80% supports preventing the mentally ill from getting guns. A majority of NRA members support these measures. Many other reasonable actions, like registering weapons, enjoy majority support, yet our policies are still driven by crackpots, demagogues and lobbyists from gun manufacturers. 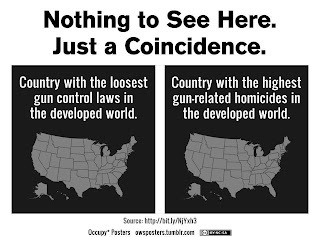 We need guns and gun laws not to be out of control. It's not unconstitutional, it's uncommonly sensible, and shows real appreciation for guns.